Of course. That's what I kept saying during "A Christmas Story," every time the movie came up with another one of its memories about growing up in the 1940s. Of course, any nine-year-old kid in the '40s would passionately want, for Christmas, a Daisy Brand Red Ryder repeating BB carbine with a compass mounted in the stock. Of course. And of course, his mother would say, "You'll shoot your eye out." That's what mothers always said about BB guns. I grew up in downstate Illinois. The hero of this film, Ralphie, grew up in Gary, Ind. Looking back over a distance of more than thirty years, the two places seem almost identical -- Middle American outposts where you weren't trying to keep up with the neighbors, you were trying to keep up with Norman Rockwell. The movie is based on a nostalgic comic novel named 'In God We Trust, All Others Pay Cash,' by Jean Shepherd, the radio humorist, who also narrates it. He remembers the obvious things, like fights with the bullies at school, and getting into impenetrable discussions with younger kids who do not quite know what all the words mean. He remembers legendary schoolteachers and hiding in the cupboard under the sink and having fantasies of defending the family home with a BB gun. But he also remembers, warmly and with love, the foibles of parents. 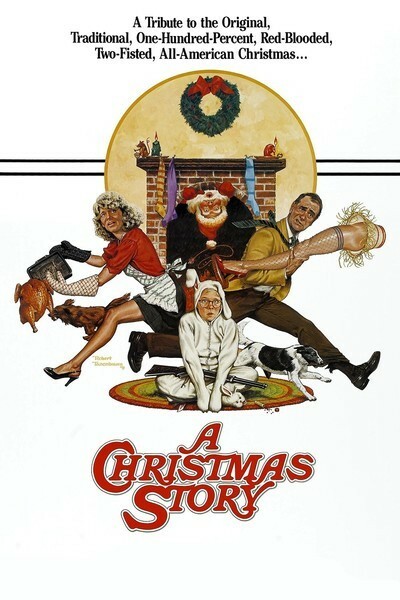 The Old Man in "A Christmas Story" is played by Darren McGavin as an enthusiast. Not an enthusiast of anything, just simply an enthusiast. When he wins a prize in a contest, and it turns out to be a table lamp in the shape of a female leg in a garter, he puts it in the window, because it is the most amazing lamp he has ever seen. Of course. I can understand that feeling. I can also understand the feeling of the mother (Melinda Dillon), who is mortified beyond words. The movie's high point comes at Christmastime, when Ralphie (Peter Billingsley) goes to visit Santa Claus. Visits to Santa Claus are more or less standard in works of this genre, but this movie has the best visit to Santa I've ever seen. Santa is a workaholic, processing kids relentlessly. He has one helper to spin the kid and deposit him on Santa's lap, and another one to grab the kid when the visit is over, and hurl him down a chute to his parents below. If the kid doesn't want to go, he gets Santa's boot in his face. Of course.